The Daily Digress: Good luck, kid. "To: S. Claus," it reads, "From: X---." 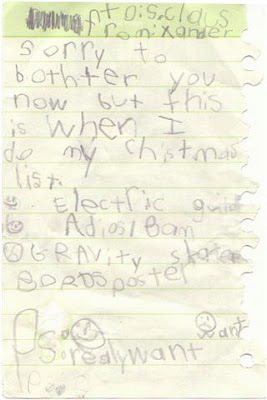 "Sorry to bohther [sic] you now, but this is when I do my Christmas list." Because his schedule is so busy that he has designated October as the month he does his Christmas list. Every year. That's when it happens, Santa, take it or leave it. An electric guitar. This is probably not going to happen, for many reasons, but his youthful optimism is precious. Adios/Bam. He doesn't really know what these are. I only know what they are because his older brother has some. They are sneakers, made (most likely in China) by a company called Adios, in honor of some dude named Bam Margera, who may or may not have committed adultery with Jessica Simpson. And bragged about it to Howard Stern. But my kids don't know all that, so Santa might come through with the shoes. Gravity skate bords [sic] poster. Will someone please let me know if these have hidden symbols that encourage devil worship or other deviant behavior? I'm old and don't have a clue. Please don't tell my kids. At the end of the note, thoughtful guy that he is, the X-Man includes a key, so Santa will know what he really wants (smiley face) versus what he just wants (frowny face). What kind of world does this kid live in? Apparently, a world in which one makes a frowny face at the prospect of receiving a gift that one merely wants, as opposed to really wants. And I remember when all he wanted for Christmas was a pair of Bob the Builder shoes and a chocolate cake.